And so passes another season of Game of Thrones. The finale did not disappoint, especially on the costume front. With such drastic changes to the characters’ wardrobes this season, it will be interesting to see if they keep the same motifs going forward, or if the characters will evolve even further, but we are left with seven episodes of beautiful craftsmanship at its very finest. 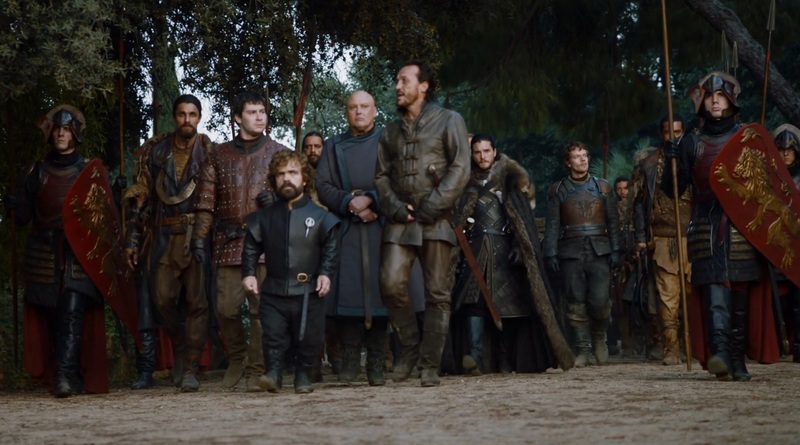 The majority of our favorite main characters arrive in King’s Landing for a Westerosi UN meeting. What’s funny to notice, right off the bat, is the difference in not only how the speaking characters dress, but how different the nameless soldiers and fighters dress. 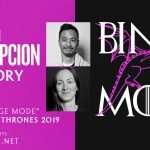 The long walk from the initial meet-and-greet to the dragon pit is full of wide shots of the Lannister soldiers in their red armor, the Dothraki warriors in their brown braided leather, and the Unsullied army in their stylized black leather armor. The first major costume to stand out is Tyrion‘s new texturized leather doublet. The shape of the vest is something we’ve seen throughout the season, and the raised leather texture has featured on his sleeves in the past, but the all over “spiked” effect is evident on every inch of his outfit, and makes a clear statement to his siblings. He is now in a very important position, and is on a very important mission, so the intimidation factor is ramped up. Still, this is probably the most like Tywin he’s ever looked, and the coolness of the black tones are more married to Cersei’s than Daenerys’. Whether it is a conscious choice or not, Tyrion is tied to his family, for better or for worse, and needs to appeal to them in one way or another to help in the war with the dead. 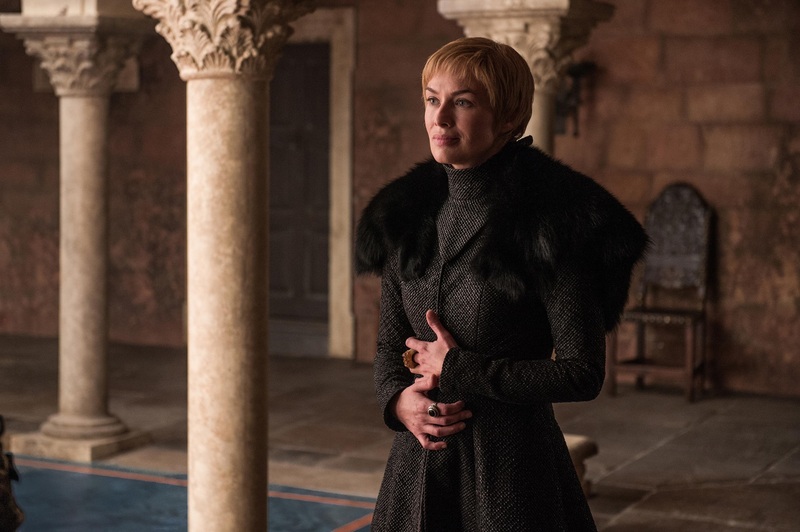 Later in the episode, when she does speak with Jaime and tells him that she has no intention of sending troops to the North, she is ironically dressed in elements of that very region. The furs are obviously very practical as winter comes for King’s Landing, but the shape of her whole looks echoes Sansa’s Season 5 wedding dress, tying Sansa to Cersei once more. 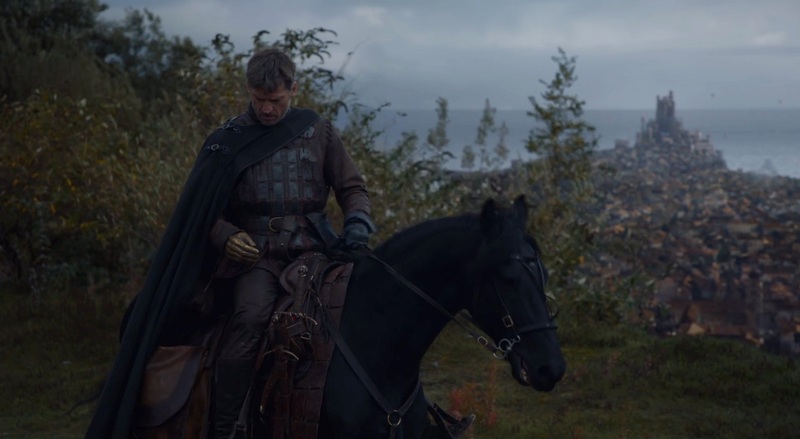 Disgusted with Cersei, Jaime leaves the capital and eschews his Lannister armor. 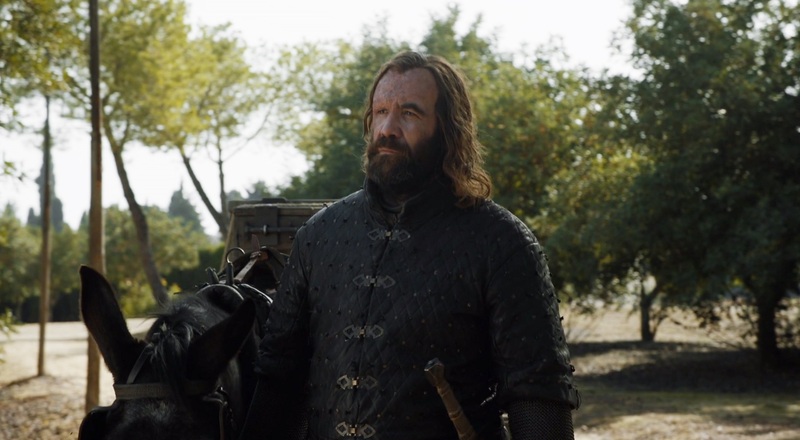 He was the last Lannister to actually wear the house colors, but now he’s not only trying to lay low as he rides away, but he’s symbolically leaving behind everything that he thought he loved. Cersei’s last effort was to keep the dynasty going, but now she’s left alone with an unborn child. Tracking back to the dragon pit, Daenerys arrives casually late on the back of Drogon. What could have been another major costuming moment for her, was wisely replaced with a more down-to-business look that we’ve seen throughout the season. Her entrance alone is enough to send prophecy paranoia back into Cersei’s head. 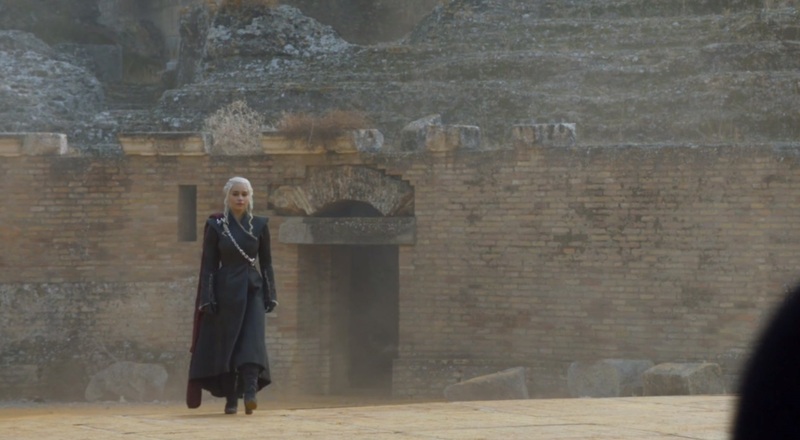 What’s funny is that this is the same coat Dany wore when she destroyed the Lannister army, the Tarlys, and all of the Highgarden bounty back in Episode 4. To further salt the wound, she adds her red scaled cape to her dragon chain to make her family name known. 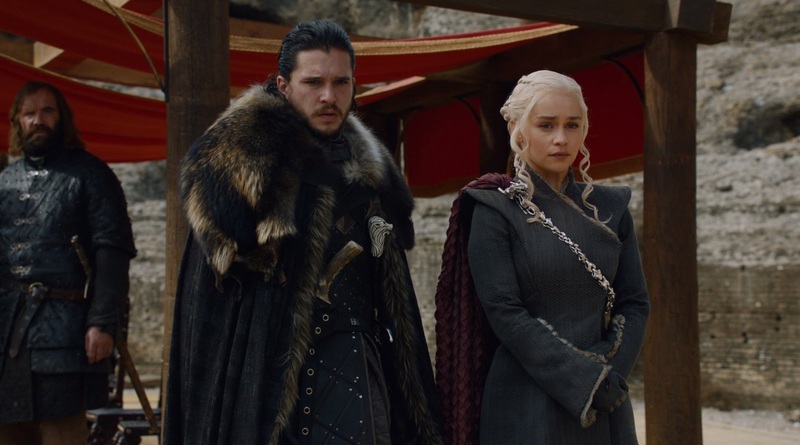 The browns in the lining of her fur also tie her to Jon’s massive fur cloak, hinting at their allegiance without Jon having had to blurt it out. 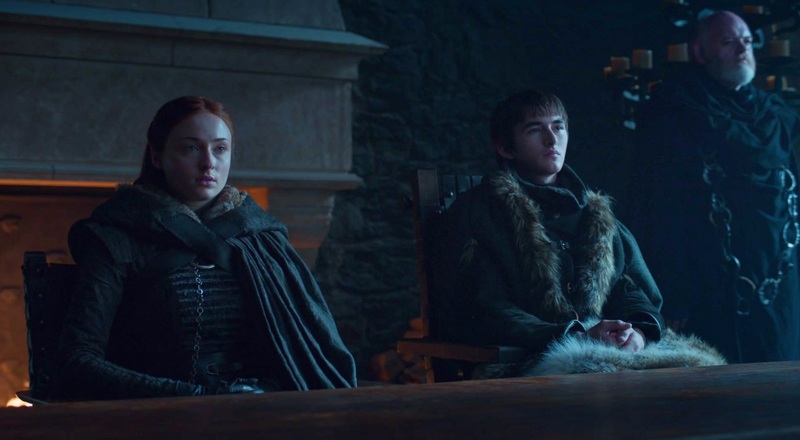 Up North, Sansa and Bran sit at the high table in a very united front. 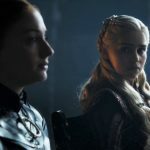 Both are wearing the formidable Stark furs, and it serves to amp up the tension and divide them both from Arya even more when she is called in. Once their game is revealed, it’s clear how Arya is meant to look like her father, taking the “I did warn you not to trust me” line full circle. 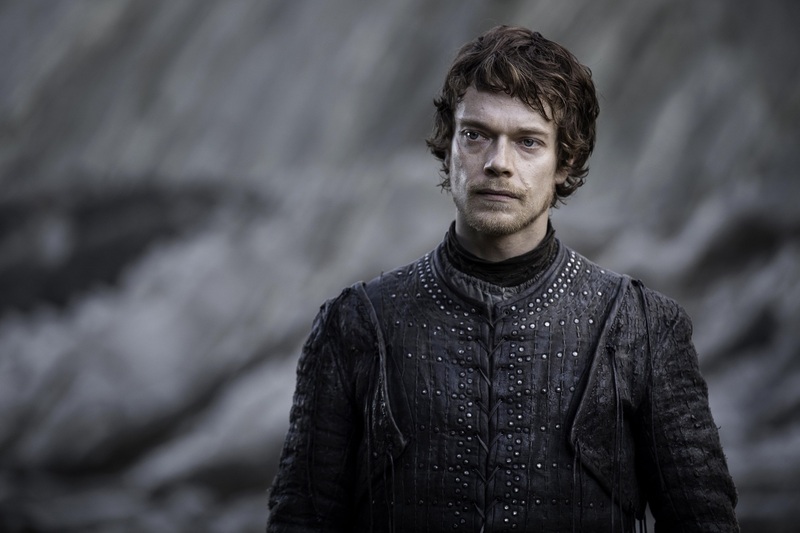 Theon, after wearing his formal Greyjoy armor to the dragon pit meeting, returns to wearing his armored shirt. This shirt is, again, almost exactly the same as Yara’s, and is the one he wore when she was captured by Euron. He is now wearing it again to rescue her, but to also emulate her strength while he commands their loyal Greyjoy fleet in her stead. The Hound gets something nice to wear! Special attention must be paid to the beautiful armor throughout the series, but the detailing is so much clearer in the sunny south. 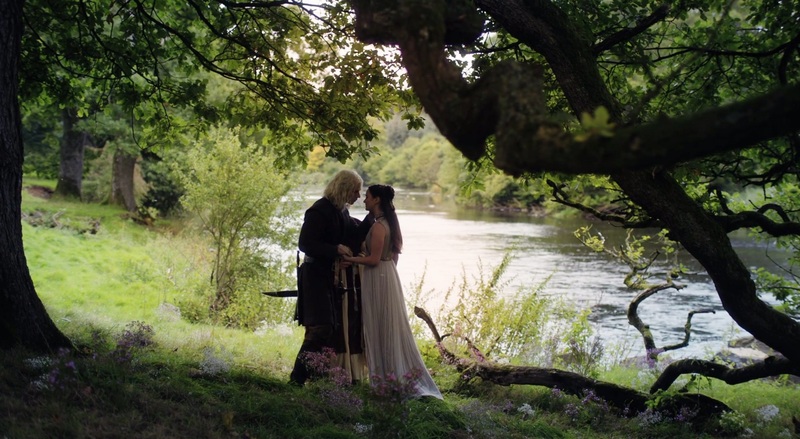 And finally, Rhaegar’s wig aside, did this scene not whack you on the head with FANTASY GENRE? Lyanna looks like Arwen in Westeros and I can definitely get on board with that. 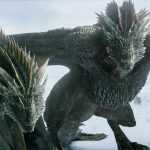 Game of Thrones Season 8 Filming Schedule & Air Date Clues Revealed! Wonderful post! Love the detail on the back of the gown Cersei wore to the Dragon Pit. So much to look at! 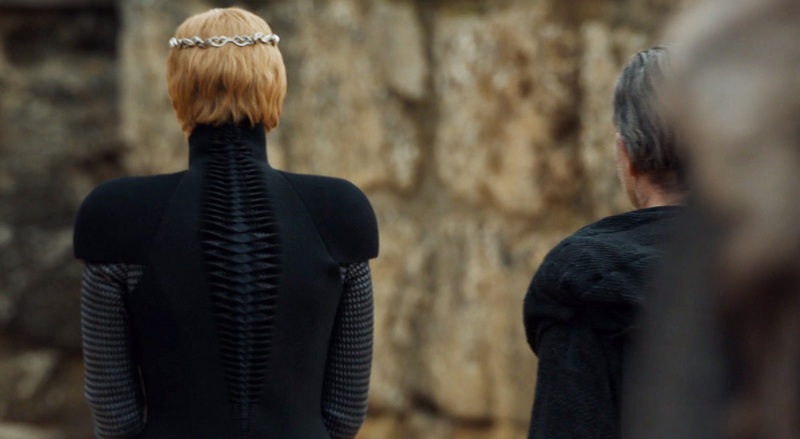 The back of Cersei’s black coat looks like the back of Dany’s winter coat. Lyanna should’ve had some blue roses in her hair. I have a gripe with Lyanna’s dress. Did the producers forget that she is a lady from the NORTH?! Just because she is in love with a southerner does not mean she needs to dress like one. Her dress looks like a Tyrell handmaiden and that harness…where are the DIREWOLVES? 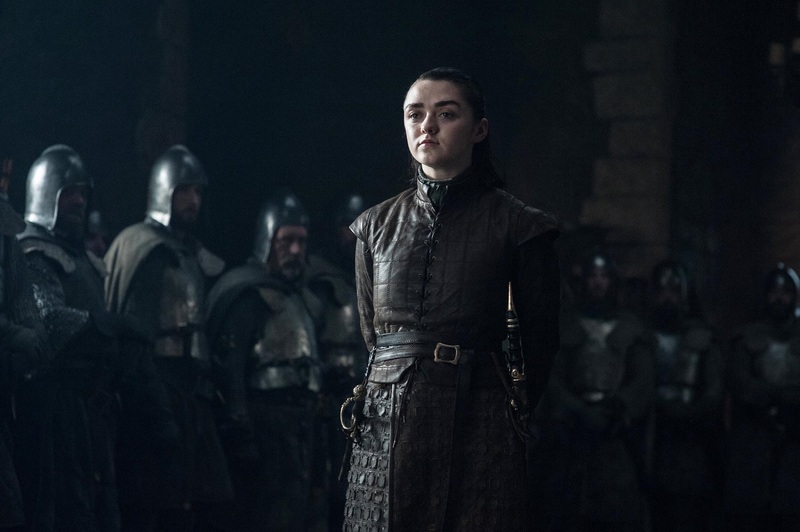 She has no traces of House Stark in this outfit and it does a disservice to her character, who was more like Arya than they make her out to be. How did she go from riding a horse as well as her brothers to this figure? D&D did not do their homework. 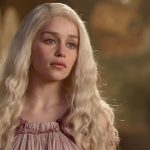 It’s been very commented in Spain how Tiryon looks to Daenerys door while boatsex. Agreed. She would’ve had some Stark embellishments, even if she wore a more southern-style dress. Finally got the chance to watch the episode today, and yes indeedy the costumes were fantastic. Wow! Thank you for some great insight into Tyrion this episode, through his choice of costume in the Dragon Pit. Still, this is probably the most like Tywin he’s ever looked, and the coolness of the black tones are more married to Cersei’s than Daenerys’. 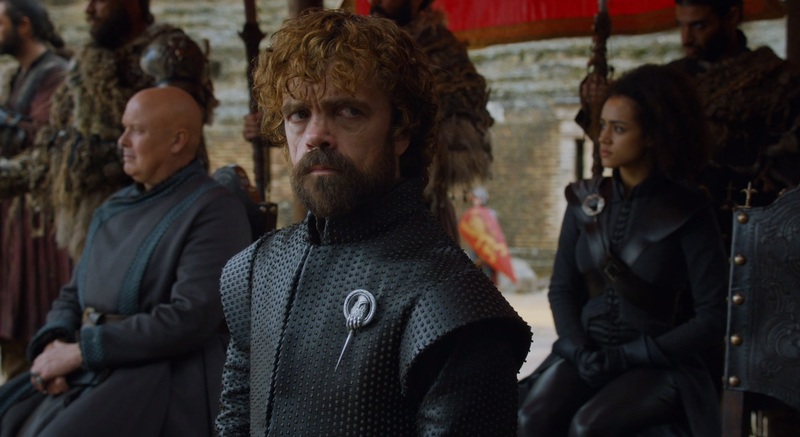 Whether it is a conscious choice or not, Tyrion is tied to his family, for better or for worse, and needs to appeal to them in one way or another to help in the war with the dead. Very, very interesting! This provides a clue as to a very important question in my mind: what happened to Tyrion and Cersei’s conversation after we cut from that scene to Jon outside? Did a man as clever and intelligent as Tyrion, believe that Cersei would send troops to the North as Jaime himself did? Or did Tyrion request that Cersei lie, as he himself had admonished Jon to do so a few minutes before in the dragon pit? 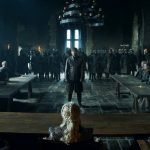 Is Tyrion completely in the dark, or has he betrayed Daenerys a tiny bit for Cersei and his future nephew/niece? Is it a Tywin and Aerys situation happening again? Yes, lots of debate about that look! I personally thought that Tyrion looked very worried. For himself. 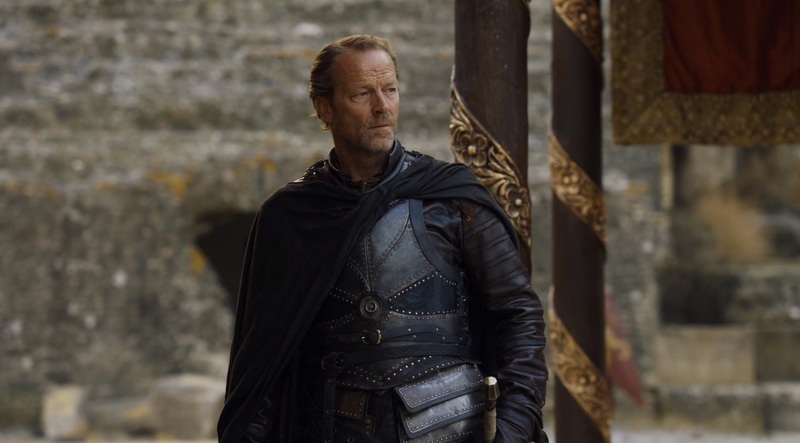 He has seen his influence over Daenerys gradually eroding over the season, starting from Spoils of War, when she listened to Jon over Tyrion’s advice. Now seeing them hook up (and strangely enough, not once has he suggested a marriage alliance, even though that was the plan in the Season 6 finale when she dumped Daario – a marriage alliance in Westeros), he probably felt his own importance and his future plans in danger. 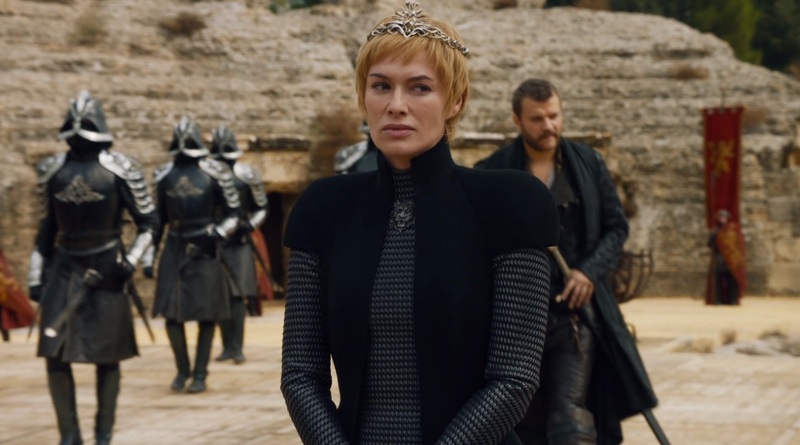 Loved Cersei’s costume except for one thing: there was some weird puckering about mid-calf on the skirt front. To my costumer eyes it looked like a bad hemming job. But I nit-pick. Then Arya could personally deliver death by a thousand cuts, with the coup de grace putting Needle through his eye and out the back of his skull. But upon further reflection and rewatch, I agree with the article about the Ned outfit taking things full circle: treacherous LF put his knife to Ned’s throat; it was only appropriate that his “lookalike” daughter execute LF with a knife to the throat. Wow… I actually think the costumes this year have been really, really bad. The worst of any season in fact, which has been a huge surprise as usually Michelle Clapton is spot on. Cersei’s gowns in particular have been just awful. They all look similar, and one looking like it was made of bubble wrap. The Dragonpit gown looked far too modern and you could see the bloody hem line a mile away. Don’t get me started on the Shredder/Kingsguard armour. And I get it’s winter but come on… There are more colours than just black/brown/grey. God I miss the Dornish and Essos- at least they wore some bright colours. I think you nailed it about Tyrion’s weird look. Ever since Dany shut him down with “enough of your clever plans” and turned to Jon for advice, he’s felt his influence and importance waning. Plus, there’s gotta be part of him that’s jealous of Jon’s rapport with Dany. And abs. As for Lyanna, I thought it would’ve been nice to accentuate Aisling Franciosi’s resemblance to Maisie W. and Kit H. in the choice of costuming. But all in all, the music and cinematography of the scene were stunning, along with Bran’s measured voice-over. Really worked for me. I’m with you. The costumes most certainly did disappoint me. I accept that there was a lot of clever detail, but when everything is dulled down to monochrome greys and blacks, it’s hard to see and appreciate it. It was a very depressing watch on the costume front. At least the common folk of Kings Landing were still rocking some colours. One again, a great article. 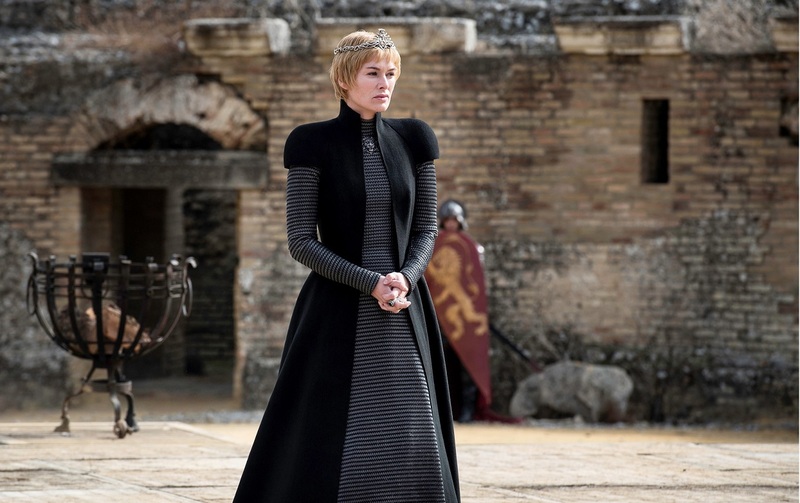 I loved Cersei’s dragonpit dress and coat. Too bad that it isn’t practical or affordable for modern day wear. Didn’t care for the spine detail on the back of the coat but that’s a quibble. And I agree that it was nice to see The Hound in a fine garment. Excellent points. I, too, am a bit suspicious about the conversation that we didn’t see between Tyrion and Cersei. 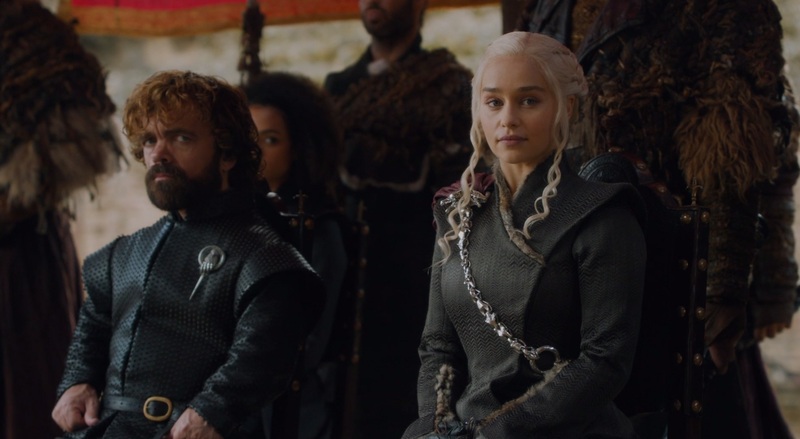 Along with “the look” – and the foreboding music – at Dany and Jon’s coupling, I wonder if Tyrion is beginning to regret his choices. His role as a master strategist for Dany hasn’t worked too well. The “clever plans” have not proven to be so clever. 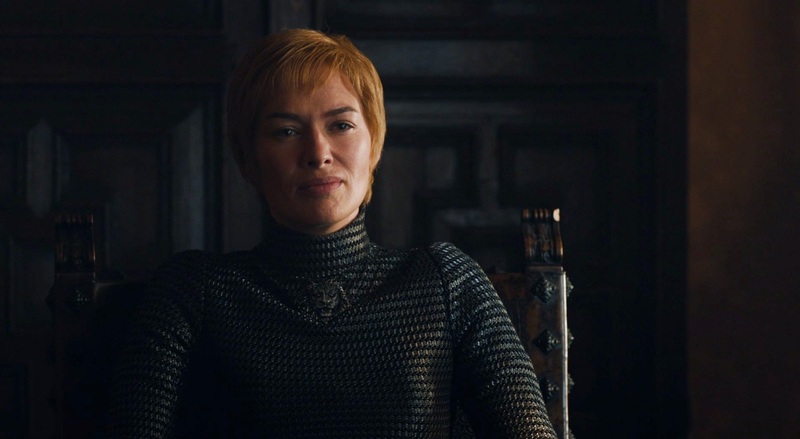 And Cersei’s comment to Jaime about being “the stupidest Lannister” makes it seem like she had been recently talking with a smart Lannister (other than herself). 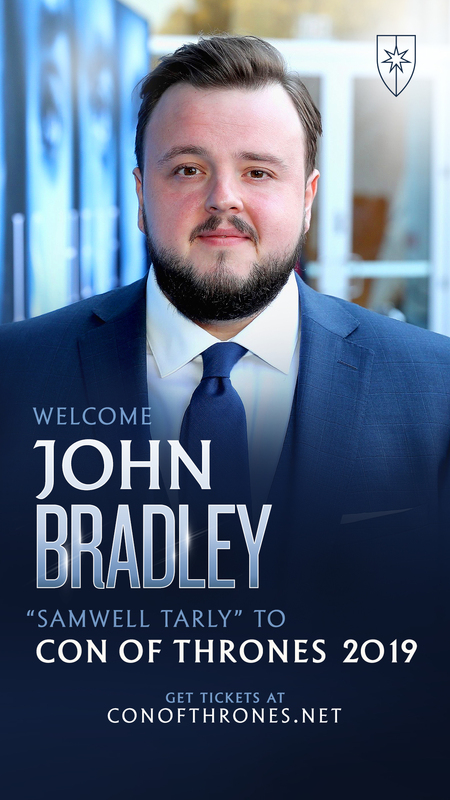 Alternatively, he is much too wary to trust Cersei and betray his alliances with Jon, Dany and nearly every other character. Regardless, I suspect that Jaime is headed to WF and, if so, he will run into Tyrion and advise him of Cersei’s clever plan. I would have made my crew re-do that hem. The “10-foot Rule” for theatre doesn’t fly on High Dif TV! I noticed that, too! I think the puckering was from a hoop or frame underneath the skirt. 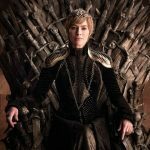 mariamb: And Cersei’s comment to Jaime about being “the stupidest Lannister” makes it seem like she had been recently talking with a smart Lannister (other than herself). Yes, I noticed that line from Cersei too. 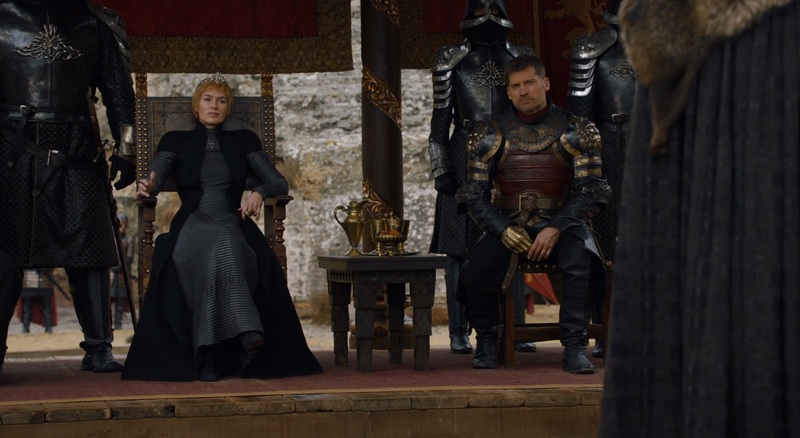 😀 Many seasons ago, it always seemed to me that even though Cersei and Tyrion hated each other, they also loved talking with each other, because they could connect at an intellectual level, that she couldn’t with Jaime. 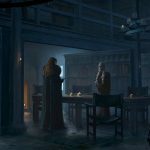 mariamb: Regardless, I suspect that Jaime is headed to WF and, if so, he will run into Tyrion and advise him of Cersei’s clever plan. Exactly. I am waiting for Jaime to meet up with Daenerys, Jon, Tyrion and others. 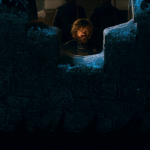 Tyrion’s reaction then, will reveal his motivations. If he is shocked at what Jaime has to say, he will at least not have known about the Golden Company. If he is mortified that Jaime revealed plans he already was aware of, it will reveal the nature of the deal with Cersei. They were married in Dorne. The temperature is much hotter in Dorne. And while it’s honorable to show some House pride, many young girls prefer pretty things, especially on their wedding day. Lastly, she’s marrying into House Targaryen. It would be natural to assimilate dress that is customary for the people associated with her *beloved* husband’s house. I can’t fault her for not wearing leather, furs, brown and grey shades, or tunics on her wedding day. 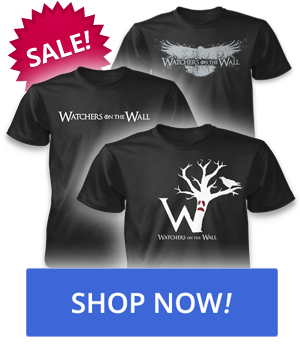 How come Cersei gets to wear her house sigil and Dany does not? I know Dany is wearing the ‘dragon chain thing’* as a stand in but jeez the Targ sigil is cool and could have show up some where! * To me Michele Clapton is an absolute genius at costume design, but has a ‘tin-eye’ for jewelry. The ‘dragon-chain’ look clunky , something more elegant should be contracted. Damnit Clapton is wrong , Dany should have a crown, tho I think someone else should design it, I am not found of Cersei’s. Notice the Dothraki wear more ‘dothraki’ than they do in warmer clines. Interesting to see what ‘arctic’ Dothraki looks like! I still don’t care for Dany dragon-riding in high fashion, I think that could catch on a dragon-spike! She should go back to her Dothraki ‘leathers’. Speaking of costumes and that dragon pit scene. Cersei : The word of a would-be usurper. Dany: So speaks the wife of a real usurper. And Cersei is actually an usurper herself! Oh, so because she is in the south she isn’t going to represent her house by wearing her house colors or sigil? Sansa got married to Tyrion in the South and her dress had embroidered direwolves on the front and on the back. Her dress even had the crisscross detailing of Jon’s cloak, a northern embellishment. She didn’t wear leather or furs in Kingslanding, but she represented her house. And Lyanna was more fiercely northern than Sansa, who was more like her southern mother. At southern weddings, the women are cloaked in their husbands colors, so they wear their own house colors before their husbands wrap them in their protection. Margaery wears a green dress with vines and roses on her wedding day to Joffrey. But sure, that’s not a thing at all. I agree with you here. Seems Lyanna would want to be pretty and comfortable on her wedding day, especially in Dorne. Also to point out that when Sansa married Tyrion, her dress had a lion motif, fitting for the house she was marrying into. The bead and embroidery on that dress was beautiful. Then, looking at her dress when she married Ramsey Bolton, I see nothing of note for either House Stark or House Bolton shown on the dress, just simple fur. I can’t get a very good closeup look at that dress though. There may be something in the clasps on the front of that dress, but I’m having a hard time finding a zoomed in image. Maybe Hogan can clarify this one. There are some amazingly beautiful GoT inspired wedding dresses out there. The meeting at the Dragonpit accentuated my biggest problem with the costuming this year: there are representatives of three kingdoms gathered, and they all look way too similar. Where’s the damn colour? I was going to make the same point as you. The detail they went to in previous seasons was astounding- especially as the vast majority of viewers never noticed the finer details. That’s why I’m dissapointed by the lack of detail/attention/imagination… especially seeing as there are fewer characters to dress and a much bigger budget. Thank you for these threads. I hope you go on to do more of the characters’ clothing evolution in the off season. In this episode, I was mesmerized by the knitted (non fur) portion of Jon’s gorgeous cape. And it made me annoyed in retrospect at Lyanna Mormont’s dig at ladies who sit home knitting in the whole women power speech she gave. No one in The north would deride how important well constructed clothing is in a frozen environment. It also made me pissed for Sansa (and I’m not one of these defend my fav characters at all Costs people) who made the first wolf fur cloak Jon wore as he reclaimed his Stark heritage. It was a stupid line to Put in the mouth of a Lady of a Northern house. Can you imagine Catelyn, for instance, saying such a thing? Anyway. 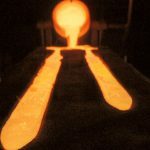 Just my clothing related gripe about that writing. Thanks for these threads, they’ve been a real treat. Well, considering she eloped, maybe she didn’t have the time or resources or even the desire to have such a garment made? Maybe she was annoyed at her House that would force her to marry someone she didn’t love? Maybe she wanted to reject all the trappings of lineage considering the wars that were at that moment or were very shortly going to break out bc of her action? More true to her actions and circumstances to not be wearing an elaborate dress. I’m just still Thinking about this and I think it’s utterly implausible that she would have any sort of dress with Stark or Tully emblems. She can’t just go to target and get the latest Winterfell fashion knockoff. Someone has to make it to order with multiple fittings, or at the very least add embroidery to an existing dress, that she probably would have borrowed. Did she bring hervtrousseau with her when she ran off with Rhaegar? With all the things likely planned for a wedding to Robert? Are they really going to take the time to make a special dress. Are they going to plan a secret ceremony in Dorne and compromise it by making some seamstresses somewhere make or embroider a dress with Stark and Tully sigils on it? The Mad King is distrustful of and probably spying on Prince Rhaegar all this time. Of course they aren’t going have a dress made. Yeah, I totally get that, but wouldn’t she have brought clothes from Winterfell with her? Ooh think of the dress Sansa could have made for her however aside from that I thought she looked lovely and young and like Jon. Disappointed with Rheagar though. OMg totally with you on that. Hate the unrelieved black. I wasn’t trying to harp on you in particulate; the topic just got stuck In my head. Lyanna had no connection to the Tully family. Both her parents were Starks. Sorry to be totally late for the party but I must make some points on the gentlemen’s costumes – all too often “fashion talk” centres around the females’ set pieces. 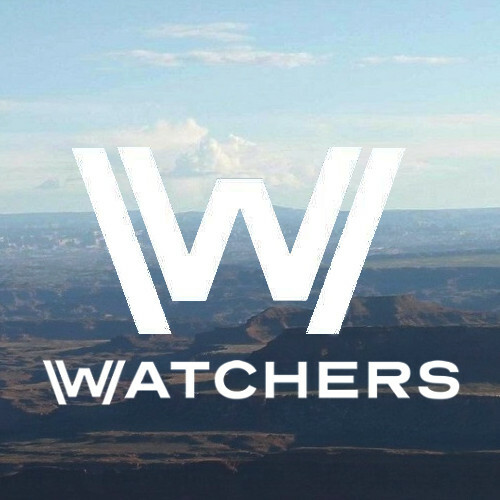 GWRPCKLFVGKENRRERKK! Stannis’s cloak! Bit of leather-edged material in front, two buckles on each shoulder, yep, what Stannis wore (I always desired Stannis’s cloak.) 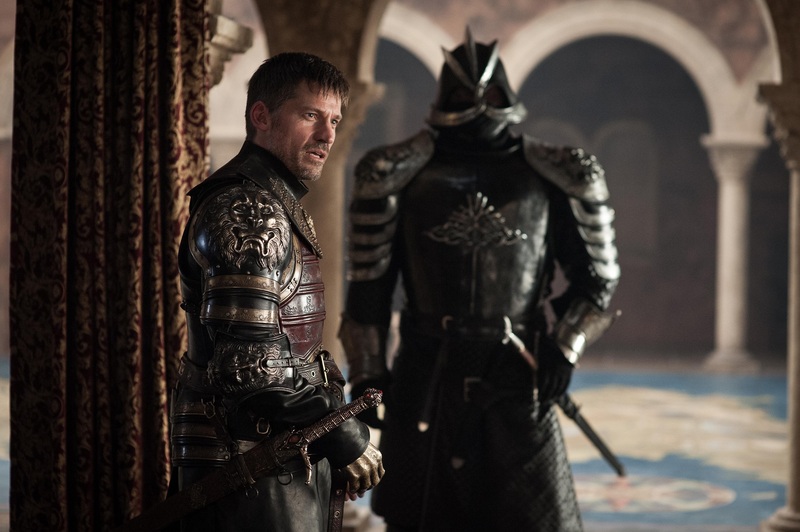 Did the wardrobe department just get a bit lazy, not making a new black cloak for Jaime, just recycling old Stannis cloak for a 30 second scene? We’ll know next season. Jaime might pop up in a different black cloack. But it will be black. 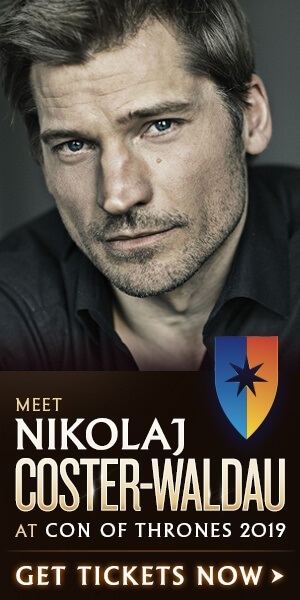 Jaime is going north to fight the real war, he’ll be a man of the Night’s Watch, haha!, after his disparaging comments to Jon Snow in S1E2, “it’s only for life” etc. haha! Jaime’s got Valyrian steel… though maybe not very good at wielding it, what with the hand and all. It’s all going to be interesting. But Jaime will be wearing mostly black from now on until he dies. Great post, as always. Thank you Hogan.